Seanine Joyce originates from Sydney, Australia where her musical training included classical piano, flute, guitar and jazz saxophone, and performing and arranging music for a variety of ensembles. She moved to London to pursue studies in Jazz piano and worked for several years gigging as a jazz, funk and pop keyboardist and classical pianist. She began composing film scores when studying at the International Film School in Covent Garden and went on to graduate from the Royal Academy of Music with an honours degree in Media and Applied Music Composition. During that time she was the recipient of the EMI Sound Foundation Award, the BMI European Student Bursary and the Royal Academy of Music’s Mortimer Development Award. 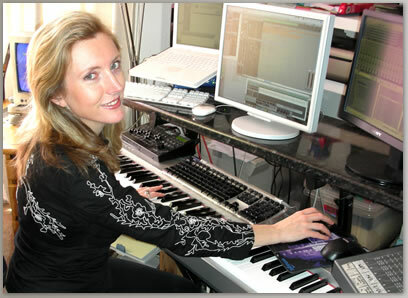 In 2006 Seanine composed the score for the feature films “Framed” and “Oh Happy Day”. “Framed”, starring Martin Jarvis and Robert Hardy is a film noir mystery thriller with a dark orchestral score. The score for the romantic comedy “Oh Happy Day” was recorded with a full studio orchestra and a gospel choir at Air-Edel studios. It was conducted by Nic Raine and features some of London’s best Jazz talent: John Parricelli (guitar), Gwilym Simcock (piano), Martin France (drums) and Phil Donlin (bass). She has also worked as an orchestrator on several Hollywood feature films including “Kingdom of Heaven”, “Over The Hedge”, “It’s A Boy Girl Thing”, “Severance” and “Blood Rayne” (full listings are available on the credits page). Also, as a copyist, creating and editing scores, she has worked on feature films such as “The Magic Roundabout”, “Five People You Meet in Heaven”, “King Arthur”, “Charlie and the Chocolate Factory” and “Corpse Bride”. 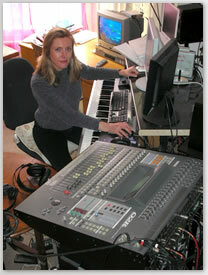 Seanine was a visiting lecturer for two years at the University of Exeter where she taught Composition, Orchestration and Electro-acoustic Composition and also as a Music Technology Lecturer at Trinity College of Music, Greenwich. As a freelance composer Seanine has also written for animation, documentaries and contemporary dance and her short films have been screened on Channel Four and at the Raindance and Kerala Film Festivals. She also receives commissions for the concert platform and her most recent was performed by the Korros Ensemble at the Deal Festival.